In many respects, the raising of Wagyu cattle is one of the few remaining generally traditional activities in modern Japan. But this is a relatively new tradition. Until about 1960, most beef in Japan was produced from cattle kept primarily for draught purposes. As machines replaced cattle as beasts of burden, raising cattle for beef became a specialized undertaking. 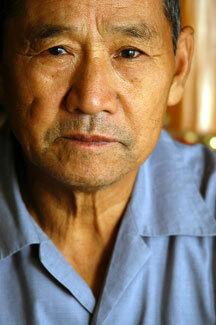 In this sense, commercial beef production in Japan has little more than a forty year history. These four decades have seen enormous changes in the production methods and in the location of cattle raising. Nevertheless, some aspects of the traditional beef cattle sector remain relatively undisturbed by modern technology. In Japan, grazing is relatively rare even with tethering. Grazing areas are only available on mountain sides and in other remote areas where rice and other crops cannot be grown. Also, as each Wagyu beast is extremely valuable and the herds so small, owners do not wish to risk the physical dangers associated with grazing. 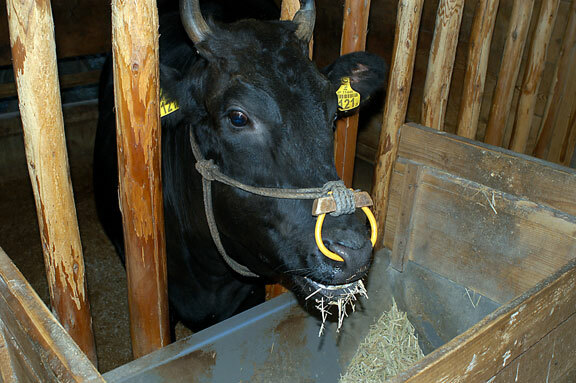 Most Japanese cattle live their entire lives in barns and adjoining pens. On breeding farms calves are raised with their mothers and both are confined to small pens at all times. The cows and calves are hand-fed on various grains and commercial feeds, as well as a wide range of roughages and fodders including freshly cut green grass, silage, hay, rice straw and in some cases industrial by-products and wastes from agricultural processing plants (such as canneries). Almost all Wagyu calves are creep fed with special concentrate rations from about two to three months of age. Calves are weaned between eight to ten months old and sold either as feeder calves to fattening farmers or as replacement heifers to breeding farmers. The majority of these calves are auctioned, one at a time on a per head basis, at special calf auction centres located in the major breeding areas. They are fed beer in August, September and October when the cows suffer from the heat and loose their appetite. Temperature in the cow shed is about 27-28 degrees Centigrade, 30 degrees outside. They are given a bottle of beer a day until their appetite returns. They get no beer at all if they have a healthy appetite. Male calves destined for feed lots are normally castrated at two or three months of age using the Burdizzo method since surgical procedures would expose the animals to infection in the damp, congested barns. Given the high value of each calf, this operation is usually performed by a veterinarian or by a specialist employed by a livestock cooperative. It is extremely difficult to classify the diverse fattening techniques employed in Japan. Young steer fattening, commonly referred to as the “ordinary” or “popular” fattening system, is the most important segment of the beef breed fattening industry. On average, the steers enter the fattening stage at around ten months of age and they are slaughtered when 27 to 28 months old, but there is a great deal of variation. In 1979 there were about 50,000 households classified as fattening beef cattle under the young steer method. While some 1,650 of these farms fattened 50 or more steers, 53% of the households were keeping only one or two head. Traditionally the fattening of female cattle took one of two forms. There was the “old cow” system and the “ideal” method for virgin heifers. Under the “old cow” system, specialist fatteners purchased cows which had finished breeding or work in the field. These animals were usually six to eight years old, but sometimes much older. The fattening farmer usually only kept one cow on which he lavished tender care for five to eight months in order to marble her meat ready for slaughter. Today the “old cow” method is still practiced except that breeding cows tend to be slaughter at a younger age than in the past. The “ideal” fattening system has an aura of importance not matched by its quantitative significance. In 1979 only 9% of households fattening beef cattle practiced the “ideal” method. Less than 5% of Wagyu cattle were fattened by these highly specialized producers. Nevertheless their product, best known to foreigners as Kobe (or Matsuzaka or Omi) is a mystical folk art. Today, as in the past, these farmers usually fatten only one or two head at a time. 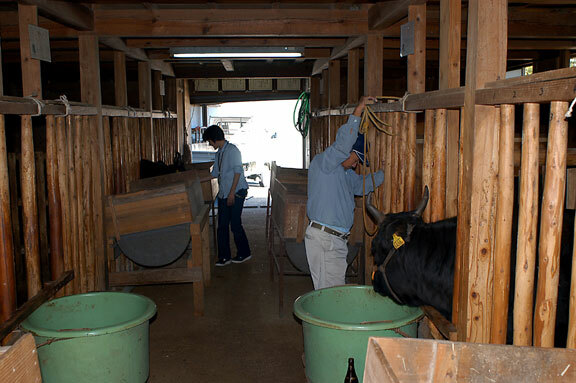 Young virgin heifers of the Tajima strain of the Japanese Black breed are the preferred animals for this purpose, although steers are also used. These animals are fed a special ration with the energy level gradually being raised as the animal is finished for slaughter at around 36 months. Management practices include regular massage with oil to improve the distribution and softness of the sub-cutaneous fat, feeding beer and other special foods to stimulate the appetite when the animal is on the high-energy, low-bulk finishing ration, and the deliberate restriction of exercise to prevent muscle toughness. The result is a mature carcass with bright cherry red meat, almost all of which is extensively and finely marbled with pure white fat. The Japanese regard this as the top grade of beef. While some Wagyu heifers are fattened for slaughter, some are retained for breeding. The retention rate needs to be high just to maintain cow numbers because calving rates are low and breeding cows are normally replaced before they are more than eight years old. Although the potential breeding life of most cows is much more than eight years, the value of their carcass drops sharply after they are about eight years old due to a darkening of the meat with age. Therefore, farmers prefer to sell their cows for fattening and slaughter at relatively young ages when the prices offered are more attractive. The national Wagyu herd could be enlarged rapidly if breeding farmers were given an economic incentive to retain, and breed from, their cows for another year or two. Well over 90% of all beef-bred females have been mated by AI since the late 1960’s. Young heifers are inseminated for the first time as early as 13 months, but 15 to 17 months is more common. Official data on conception rates suggest that the success rate with AI matings is usually in the 82% to 85% range. The national average calving rate, when expressed in terms of the number of calves born divided by the number of available females, appears to be well under 60%. The cows are kept in small cow sheds and almost never let outside. Kobu takes them only out for the massage which is dine right in front of the shed and is very careful not to tire his cows. It is not easy to obtain meaningful detailed production or growth-rate data on beef cattle in Japan because there are so many differences in the methods of feeding and the period during which cattle are fattened. The general picture which emerges is that Wagyu steers enter feedlots at around 10 months when they weigh about 285 kg. They are then fattened for 18 to 19 months until they reach about 630 kg liveweight. The daily gain in liveweight during fattening is, therefore, a little over 0.6 kg a day. For the first half of the growing and fattening period, the diet may be relatively low in energy and high in roughage. In fact, farmers may even restrict concentrate rations in an attempt to prevent excessive fat being laid down. In the latter stages of fattening the steers will be on high energy rations. The result is a carcass with a high degree of fat (subcutaneous, intermuscular, intramuscular, and internal). Careful dissection has shown that while the average Wagyu steer carcass contains about 35% fat, in some cases fat can constitute more than 40% of the carcass. Most Wagyu carcasses require trimming to remove the excess fat on the outside of the body, and some trimming of internal fat as well. Kobu's cows also never bear calves. He keeps them for three years after which they are sold. 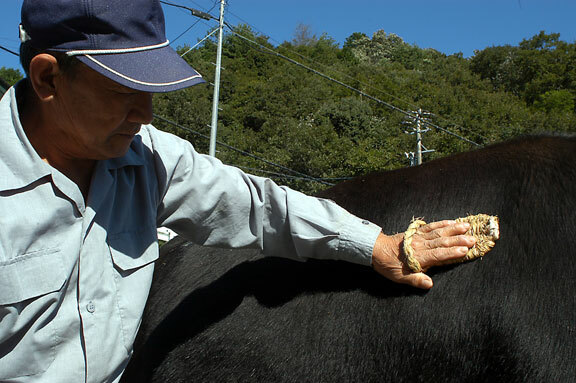 Feed costs for the three years come to about 500,000 to 600,000 yen per cow. One cow can fetch up from 1 to 50 million yen, depending on how judges have judged the cow and sentiment at the auction. Although Japanese Blacks and Herefords appear to be comparable in terms of feed conversion ratios, the feed utilization pattern favours the Herefords since they achieved a better weight gain on much less concentrate feed than the Japanese Blacks. Nevertheless, there continues to be little, if any, interest in breeding European beef cattle in Japan. Japanese Blacks achieved a much higher marbling score than the three other breeds. As the marbling score (sashi) plays a dominant role in the Japanese carcass grading system, the Japanese Black carcasses would be judged to be of higher grade. The Japanese Blacks ate the most concentrate feed and recorded the second lowest daily gain: their higher grade beef was obtained at a higher cost. For more information about Japan --- particularly Japanese culture and customs --- please visit Japan for the Uninvited. From Beef in Japan by Prof. John W. Longworth, University of Queensland Press, 1983. This book is currently out-of-print, and this information is used here with the kind permission of Prof. Longworth. If any of this information has changed in the past 21 or so years, we would greatly appreciate it if you would please e-mail us. We will gladly update this information. Photographs for Lucies Farm by Kjeld Duits. Copyright © 1998 - 2010 by Lucies Farm Ltd.